@Bobette wrote: GUYS. Hometowns have begun, and Number 12 has a name. She's Brooke Blurton and she's "the first ever Indigenous contestant to make it to the final 4". Seems like a token gesture, but more diversity on TV is never a bad thing IMO. The Bachelor Australia has been criticised in the past for its lack of cultural diversity. And it seems that the upcoming season will buck the trend, with an Indigenous contestant making it to the final four for the first time in the show's six year history. New Bachelor Nick 'The Honey Badger' Cummins, 30, was pictured at Sydney Airport on Thursday before catching a flight to Perth, with a source telling Daily Mail Australia that he was there for a home visit with Brooke Blurton. In Bachelor speak, a 'home visit' means a contestant's relationship with the show's leading man has progressed to the point where he meets her family. In the past five seasons of the program, which is currently produced by Warner Bros. Australia, all the women who have made it to the final stages of the competition have been white. Hailing from Perth, WA, Brooke is a Noongar / Yamatji woman who competed in the 2016 Miss NAIDOC Perth pageant. The 21-year-old beauty also works as an administrative officer for the Ngaanyatjarra Council Aboriginal Corporation. On-set photos reveal the reality TV lovebirds previously hit it off during a date which saw a shirtless Nick 'rescuing' Brooke while dressed a fireman. As Nick held Brooke tightly in his arms, she slung her arms around the former Wallabies star's neck as they gazed into each other's eyes. Spotted at Sydney Airport on Thursday, Nick dressed casually in striped jumper, chinos and white sneakers. With a backpack casually slung over his shoulders, Nick strolled through the terminal looking wide eyed and full of anticipation. The rugby union star graciously posed for photos with sports fans at the airport before boarding his flight to Western Australia. Brooke seems way too good for this show IMO Channel 10 approached her with an offer she couldn't refuse - Top 4 guaranteed and a platform to raise important Indigenous issues on national TV perhaps? I look forward to seeing her on screen. Oh look, Daily Mail just published a story based on the exact video I posted yesterday. What a remarkable co-incidence. Anyway... ITA @Agent99, Brooke is a cut above the usual contestant. I can't imagine she applied for this - IMO, TPTB went hunting for an Indigenous girl to counter-act the claims from last year about the lack of diversity and hit the jackpot when they convinced her to be on the show. I think her Insta will be far deeper than the shilling/fashion/cosmetics crap we usually see. She seems totally switched on and I'm sure she will use this as a springboard to bring awesome things to her community. @Bobette you should be asking for a cut on sales of the DM. 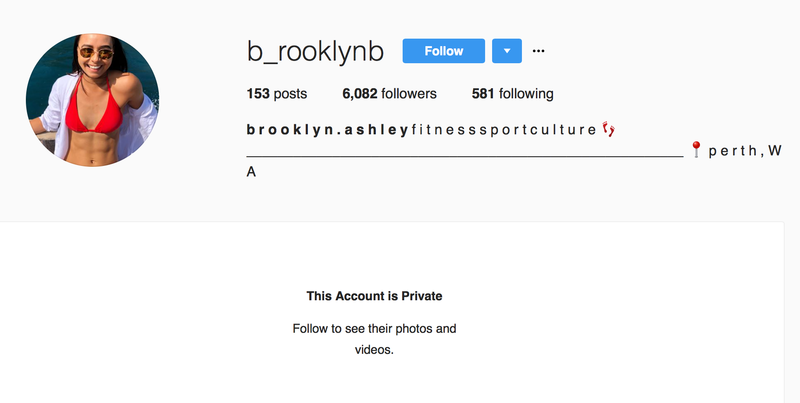 Brooke's following stats have changed. Unless two people she was following have deleted their accounts, she is now following 579 people. This means she has since likely been out? Likely to have placed F3? F3 is perfect if they want Brooke as Bachelorette 2019 IMO. If F2s are cast as Leads they have to go through that whole "Yes, I was broken hearted, but I've healed now and yada yada yada..."
With Matty, half his first date (with Elora) was him waffling on about how he was over Georgia. BORING. F3s are far enough removed that they don't have to pretend to be broken hearted, IMO. Have just noticed that Brooke is the only one of the F4 that Sister Liz is following, are we sure that she went out at F3, or did we just decide that because we thought she would make an excellent next Bette? I'm pretty sure we had a good reason to think she went at F3 but can't remember what it was. IMO sister Liz following her (good pick up but the way!) is more reason to think she's not final 2 - it would be "safe" for Liz to follow her, the same can't be said of either of the final 2. I expect TPTB gave the family a strict warning about not showing any preference for the final 2. They're both following each other. Liz follows a ton of people, so I'm wondering who followed first.